..but here’s the way to say “be mine.” A gorgeous piece of jewelry doesn’t need to be four figures (or even three) to sweep her off her feet. Ethically and environmentally superior DiamondAura® gives you all the fire and clarity of ravishing red rubies and white hot diamonds without the sobering price tag. Perfected by science, DiamondAura is hard enough to cut glass and retains every jeweler’s specification including color, cut, clarity and carat weight. In fact, without a jeweler’s loupe, you can’t even tell the difference. The Be Mine Bracelet features four teardrops of red perfection surrounded by scintillating white sparkle. Romance doesn’t have a price tag. A thing of beauty, is just that—a thing of beauty. 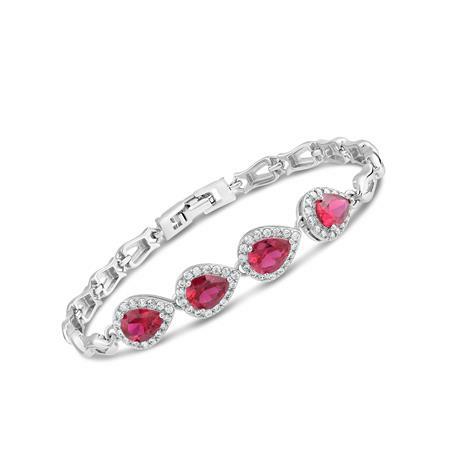 She’ll absolutely love this bracelet, and at this price, you’ll love it too.